Kicking off summer of 2017, The City of Leawood opened their very first universally accessible playground in City Park that is now a Playcore National Demonstration Site. After a year of planning, designing, and fundraising, a playground designed for all abilities will now provide the opportunity to play for ALL children and parents, particularly those who have disabilities or injuries. Cunningham Recreation’s Play 4 ALL worked closely with the Leawood Parks Foundation to identify potential funders and coach on development strategies. Major donor, Variety KC, joined the project by becoming the naming sponsor. 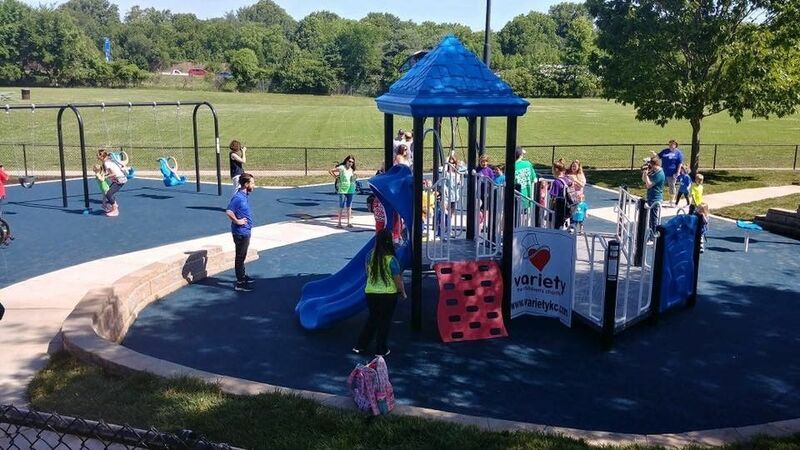 This playground is Variety’s 4th naming partner sponsor in the Greater Kansas City area. “The City of Leawood and the Parks Foundation are very dedicated to provide a place for families to play with no barriers including physical barriers, socio-economic and social barriers. ALL are welcome” says Victoria Schmitt Babb, Play 4 ALL Community Resource Director. Gifts supporting the playground came from family foundations, local companies, individuals and groups. It was a true community effort.